The best thing about Roach’s writing is that she is inexhaustibly curious, and is willing to ask all kinds of questions no one else will, such as whether she can give the space shuttle toilet a try. She traces the history of the space bathroom back to the Gemini and Apollo missions, in which astronauts had to, well, crap in a bag that they held underneath them, pinching it shut as soon as they finished. I’ll admit that I’d never gave much thought to how central a role gravity plays in our bathroom experiences. The next generation of toilets had blades that sucked down and pulverized all the matter, but that didn’t work so well because one it was freeze-dried it turned to dust and started floating around the cabin. Apparently, some astronauts even stopped eating so they could avoid pooping in space. This job sounds more and more glamorous all the time, doesn’t it? Urinating in space is tricky too, especially for women. The men, at least earlier on, used a collection device much like a condom, which of course isn’t terribly helpful for a female. Now there’s a funnel type contraption that works a bit better, and the toilets have rushing air that pulls the waste down and away. You can imagine how much fun it would be to participate in the studies and trials for designing these things. Speaking of studies, the most disgusting ones Roach uncovered are those designed to test humans’ limits for tiny spaces and lack of hygiene. NASA conducts bed rest studies to observe the effects of doing nothing on the human body. As Roach puts it, “NASA will pay you to lie in bed.” Good to know. She talked to a study participant who isn’t allowed to do anything—not even to get vertical—for 3 months. Staying horizontal for that long provides insights into what microgravity does to an astronaut’s body in space. So these subjects sit there in their own juices for months on end. Similar studies observed dandruff on the heads of participants who didn’t wash their hair for weeks, as well as microbes on the skin. Dandruff and dander are also real problems in space, because they cause some nasty odors and you can’t just go outside and shake off. Anything that flakes off the skin or hair stays in the cabin. Roach asked an astronaut whether “it was just like a snow globe in there,” which conjures all kinds of weird images, as does her report that some early astronauts stripped down to their skivvies in the cabin. These are just a few examples of the expansive weirdness Roach uncovers. She talks about masturbating monkeys in space, throwing up in zero gravity, stir-craziness, and more. 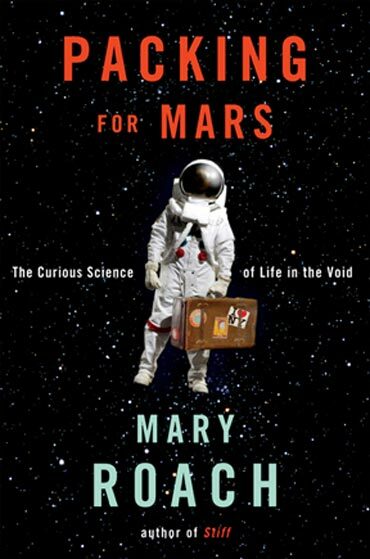 I wonder if any of the 200,000+ people who applied for the one-way trip to Mars read this book, although those who remain undeterred might be more assured that aeronautical engineers and scientists have done their homework, no matter how gross.